So, where did the two of you meat? I like my steak well aged, but not that old! 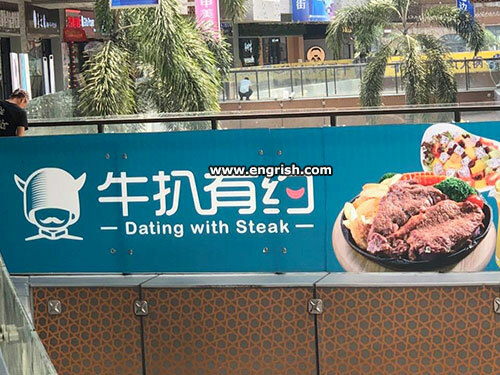 Gives an entirly new meaning to “steakhouse”. Find a nice grill and take her to a movie. – I went on a date last night. – Well done, my boy ! – Not really, more like medium rare. The angle of the dangle is equal to the throb of the knob, provided the heat of the meat remains constant. She, most certainly, has a beautiful cut. Yes. To the nth degree. – So how was your date with Sir Loin ? It’s better to date someone who’s marbled, rather than someone who has lost theirs. – So how was your date last night ? Maybe you’ll get to bone. Dating with stake, is what Buffy the vampire slayer does. Met her in Salisbury. Her name is Patty. From this point on the relationship started to sizzle. Started from rare and then became well done. The way to a man’s heart is through his stomach, after all. Dated a beefy girl once. That was a Miss Steak. I ordered a Minute Steak at a Motel restaurant once. That’s when I realised that it was not “Minnit” but “Mine ute”. AH! The gaining of wisdom. It’s not steak. It’s Snake. Grilled Boa Constrictor, to be precise. Apparently, the price puts a real squeeze on your wallet. Harking back to yesterday’s posting and the tyo. “In space no one can hear dough scream. As many a pulchritudinous young damsel shacked up with a wealthy ancient businessman, can attest . It may not scream, but it has a very audible clarion call. @Long Tom | 8:41 am: After cardiac surgery it almost feels like they went in that way! Wasn’t it in the movie Portnoy’s Complaint? He used apiece of Liver. Also. What is the significance of a Guardsman, with horns on his Bearskin. From ten thirty till well after eight. From lunchtime til nine the next day. Like a piece of old steak. Until 23 hours 56 minutes and 4.1 seconds the next day. Well, Miss, may I take your order now? Waiter, which steak would you recommend? For you, Miss, I heartly recommend the tube steak. In fact, I’ll be happy to personally provide you a sample, pro bono. Forget the steak. I shall take the fillet.